"Gates Hall gets a test drive,"
"High-tech design ushers UW Law into 21st century,"
of legal and professional education. "Law school joins the campus core,"
Microsoft cofounder Bill Gates and his wife, Melinda, donated $12 million to the law school, making the Gateses the largest private contributor to the project. William H. Gates Sr., for whom the building is named, is a retired partner of the Seattle law firm Preston Gates & Ellis. 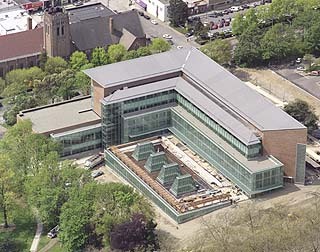 Marian Gould Gallagher Law Library: Located on floors L1 and L2, the law library includes a 10,000-square-foot reading room and 40,000 square feet of library stacks. Eighteen-foot-tall skylights help illuminate the reading room. Computer terminals are located near the library’s entrance for quick access, and most of the collection is open stack. Classrooms: Located on the first two floors, the classrooms feature wireless Internet access, “smart podiums” capable of supporting a wide variety instruction technology, voice enhancement systems and video-conferencing technology. Spaces include a 170-seat classroom designed to function as a trial court, as well as seminar rooms and law clinics. 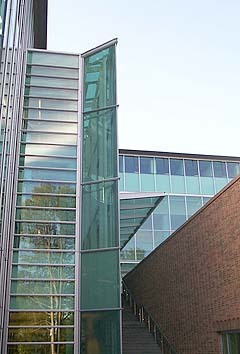 Amenities: Students have access to a 28-person computer lab on the second floor, a remote learning lab and 12 group study rooms. Remote Internet access is available throughout the building and on its outdoor terrace. Other amenities include a coffee shop, a student-only lounge in the library and showers.